Gilbert Herman Hoellerich, 94, of Raleigh, North Carolina, passed away peacefully on January 10, 2018. He was born February 24, 1923, in Jefferson City, Missouri, and was the only child of August and Emma Stroessner Hoellerich. He spent most of his childhood in Russellville, Missouri, where his father worked as a carpenter, and he graduated from high school there in 1943. After graduation he joined the United States Army, saw combat in France and Germany in WWII, and served as a rifleman on the front lines during the Battle of the Bulge. After the war he served as a Military Policeman and translator, receiving an honorable discharge in March 1946. Gilbert enrolled at the University of Missouri in Columbia in the fall of 1946. He married Fairy May Steele, a Business Education teacher, on August 7, 1949, and graduated in June 1950 with a degree in electrical engineering. 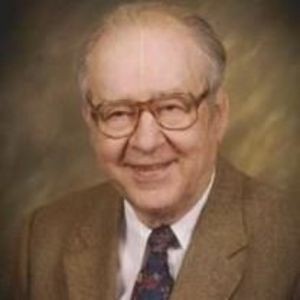 He spent his engineering career with Bell Telephone Laboratories in Quality Assurance and serving as a Field Representative in Michigan and Nebraska until his retirement in 1980. After retirement from Bell Labs, he and his wife moved to Fayetteville, Arkansas where he taught math classes at the University of Arkansas and computer science at the Northwest Technical Institute until moving to Cary, NC in 1998. Gilbert is survived by his wife of 68 years, Fairy, and his two children and their spouses: Vincent & Karen Hoellerich of Raleigh, NC, and Joyce Ann (Hoellerich) and Michael Miller of Round Rock, TX. He is also survived by six grandchildren: Emma, Joseph, and Jacob Hoellerich; Jessica Scoville, Kirsten Pope, and Adam Miller. He also leaves behind six great-grandchildren. The family expresses its sincere gratitude to those staff members of The Rosewood Health Center (Cypress of Raleigh) and Brighton Gardens of Raleigh as well as Dr. Steven Liebowitz and Dr. Taylor Goodnough who have provided such compassionate care for Gilbert in his last years of life. There will be a burial with graveside service at Trinity Lutheran Church Cemetery in Russellville, Missouri at a later date.